San Diego Comic-Con, one of the biggest events of its kind, is just one week away. It's running from 20th-23rd July, and Nintendo has now confirmed its plans for the event. Nintendo will have a booth within the main convention center (no. 235), but it'll only have one game on show there - Super Mario Odyssey. As is now the norm the company's main attendance will be in the nearby San Diego Ballroom in the Marriott Marquis & Marina hotel, which will be open to the public and not just expo ticket holders. The full line-up of games that will be playable in the hotel ballroom is below. There'll be New Nintendo 2DS XL models to try out, along with various 'social competitive' events and promotions; the press release blurb for that is below. Fans who want to show off their competitive side will have multiple opportunities to compete in an ongoing multi-game competition, the Play Nintendo Challenge, for the chance to receive cool giveaways and a chance to win a prize, while supplies last. These competitions are open to the public and will be hosted at the San Diego Marriott Marquis & Marina space at various times throughout the week. Participation will be on a first-come, first-served basis. If selected, competitors will start with an eight-player Turf War match in Splatoon 2. The winning team of four will then compete against each other in the hit fighting game ARMS. The final two players will enter the finals with a one-on-one battle in upcoming Nintendo Switch game Pokkén Tournament DX. The Play Nintendo Challenge will be open 10 a.m.-7 p.m. on July 20 and July 21, and 10 a.m.-5 p.m. on July 23. Finally, it wouldn't be a Nintendo press release for an expo without a word from Bowser - well, Doug Bowser, Nintendo of America’s Senior Vice President of Sales and Marketing, but you knew that already, right? Bringing our games and experiences directly to the fans is very important to us. Since San Diego Comic-Con is full of so many Nintendo fans of all ages, it’s the perfect place to let everyone enjoy many of our upcoming games. It seems like San Diego will have quite a lot to offer Nintendo fans next week; are you planning to go along? I need to save up some cash. That's a nice little line-up they have going for the Switch there. I wish I lived anywhere near Cali. Oh to dream. Doug Bowser talks about "upcoming games", yet the majority of games Nintendo will have on display have already released!!! His name never gets old. @LegendOfPokemon Does it always have to be about announcements? Can't they just promote what they have for once lol? Every time people just use his last name for a quote, it always gets me. I really want to see more of Fire Emblem Warriors. Only the first 20? I'm not going but even then that's just cold Nintendo! 1 2 Switch is there. Super Bomberman R is there. Breath of the Wild the most important launch title isn't there?!? What the heck Nintendo! Some of the 3DS games are way too old. Super Smash Bros. for 3DS came out in 2014! Are they serious? Why don't they have Kirby: Planet Robobot or something. @ZurapiiYohane I hate how popular they have become. I mean, I'm happy for Nintendo but I wanna go eventually! @DaLoneSheep every Switch game in the list is multiplayer, I think that's how they're promoting it at this event, probably why BotW isn't gonna be there. @DaLoneSheep plus BotW doesn't need advertisement, it's pretty much been selling itself. @DaLoneSheep I reckon Nintendo views gamer crowds at such events as an opportunity to further promote its platforms' social value of local multiplayer. Most of the featured titles, especially in NSW lineup, can be played together; BotW can't. And on closer inspection of the picture, it also shows that there is actually quite a bit more detail to New Donk City than was previously mentioned and/or claimed, so to me, it's so-called blandness is highly exaggerated. Sure, it's not as richly populated or filled with stuff like the other levels, but I see a lot of very subtle touches, that clearly make it visible that this is something well above the previous generation of Nintendo hardware. Most importantly when displaying a realistic city, is environments and street furniture having the right look and feel, as in the textures looking good enough to convey the correct appearance of the material they are supposed to be made from, which, with current hardware, should be ever closer to reality, unless of course you choose a non-realistic appearance for your game. 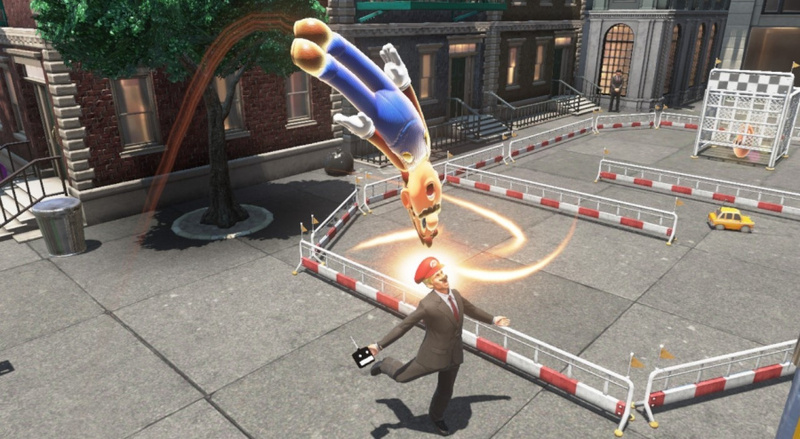 Besides that, there's subtle variations in the colors of the lights behind the windows, realistic differences in edges and height of the street tiles, good quality shadows, realistic grading and detail on the gates, and there's actually also quite a bit more detail in both Mario's and the man's suit than you would think at first glance when watching a trailer. The tree and its leaves look good too. @ShadJV the already released games are there for people who don't have Switches because so that they will buy Switches. Breath of the Wild should be there so that people can experience one of the systems best games. @nhSnork maybe so, but I feel like some Switchless attendees will be sad that they can't try out one of the systems best games. @DaLoneSheep It's better cured with an eShop demo, but it seems the game's already impressive sales and accolades lead Nintendo to believe making one isn't a priority. Besides, showcasing all of the good stuff in the game condensed might be tricky - some mechanics involve different environments and situations, some can be even spoilery to an extent. There's SO much to do in BotW that any demo might be hard-pressed to do it justice. @DaLoneSheep Nintendo knows everyone there will have Breath of the Wild already. @DaLoneSheep except it can be played on Wii U so it's not exactly an exclusive, and people who were into Zelda (or gamers in general) were already well aware of the game, I doubt there's many people undecided on if they want BotW (and want to buy the pricier Switch for it instead of a cheap used Wii U). The other games however need the publicity. I saw the news on the main page, read "Bowser" and guessed that Thomas had written the article.... I wasn't wrong. Anyway, ignoring the little puns with Bowser, its nice to see Nintendo is bothering to do a good marketing campaign this time. Comic Con is a huge event, and will be a great event to promote the Switch and a heavy hitter such as Mario Odyssey. The format for their little competition sounds vaguely familiar, like a certain NES world championship tourney they held. Guess this is the Switch World Championship. Also, as a related side note, Pokken Tournament DX will be playable at EVO in Las Vegas this weekend (even though the Wii U version didn't make the cut for the lineup).